Boutique Studio w/Free A/C,Wi-Fi "Studio Calisto"
STUDIO CALISTO located on 31 Rua Do Casino is a beautiful studio apartment which is fully equipped to meet your self catering needs and is furnished throughout to a high standard. FREE WIFI, AIR CONDITIONING and satellite providing Portuguese and English channels on widescreen TV. Guests of STUDIO CALISTO have access of COMMUNAL ROOFTOP TERRACE mostly used by STUDIO CALISTO guests. 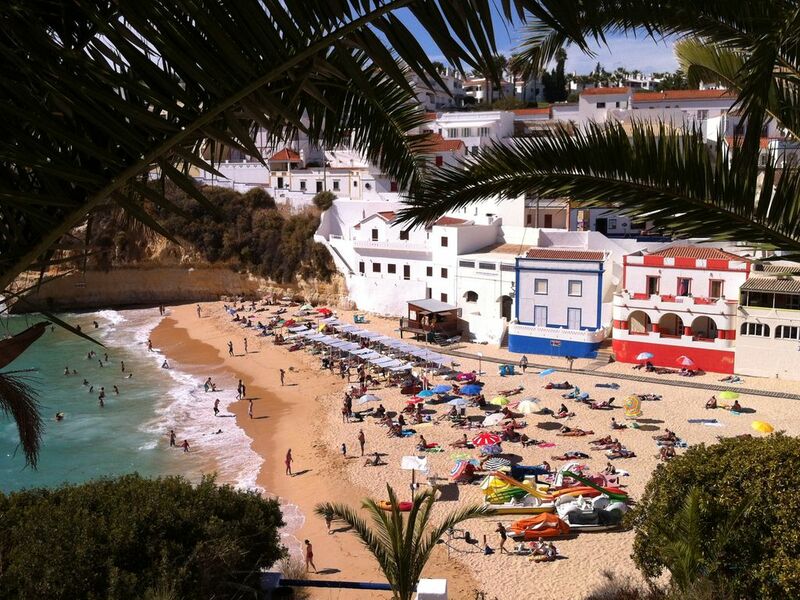 It is situated in central Carvoeiro and is literally within 100 metres of picturesque Carvoeiro beach and all the facilites that Carvoeiro offers including numerous cafes, restaurants and shops, not to mention the additional beach of Paraiso.There is lift access, stairs and private off road car park with secured parking for one car. Studio Calisto is compliant with the rental license legislation in Portugal and as such it's location, facilities, ownership and suitability for rental have all been verified. Maid service provided once weekly. FOR LONG STAYS MORE THEN 4 WEEKS CONTACT OWNER FOR SPECIAL PRICES. Fully fitted bathroom with tub and shower over, bidet, toilet and a full size bathroom marble counter. Fully fitted kitchen with fridge, stove, dishwasher, washing machine, microwave, coffee maker, tea kettle, toaster and dishes glasses and cutlery. Studio Calisto is a Beautiful Studio Apartment Which is Fully Equipped to Meet Your Self Catering Needs and is Furnished Throughout to a High Standard. Free Wifi, Air Conditioning and Satellite Providing Portuguese and English Channels On Widescreen Tv. It is Situated in Central Carvoeiro and is Literally Within 100 Metres of Picturesque Carvoeiro Beach and All the Facilites That Carvoeiro Offers Including Numerous Cafes, Restaurants and Shops, Not to Mention the Additional Beach of Paraiso. "FABULOUS VACATION IN FANTASTIC STUDIO CALISTO"
A wonderful month spent in this beautiful stylish studio in Carvoeiro center. Studio Calisto is equipped with everything needed to make your vacation a special one. Beautifully decorated with wonderful color scheme throughout the studio. This studio is a paradise awaiting! Perfect size apartment for my husband & I, beautifully decorated & fully equipped. Very close to amenities & a short walk into Carvoeiro town & beach. Would definitely stay here again. A beautiful apartment that has everything you need for relaxation and comfort. Well maintained. We stayed at Gilbert's Apartment Destino instead of the Studio Apartment. There was a mix up in our arrival time but Gilbert and Celia got things sorted for us immediately. We were really impressed with their care and attention to our needs and their desire that we had a good experience. As for the apartment, it has everything you need for a relaxing stress-free holiday. Everything is near at hand. Beach, restaurants, shops etc. The apartment is immaculate and has a homely feeling about it. We have stayed in Carvoeiro many times in different parts but Apartment Destino ticked all the right boxes for us. We highly recommend this Apartment. We WILL certainly be back to it again. We actually stayed across the hall at apartment Destino, as we had a friend join us at the last minute. Gilbert was very accommodating and let us change to the bigger apartment. We were able to see the studio though so I can tell you both places are beautiful. Fully equipped kitchen, much better then many places we have stayed. Celia was there to meet us, provide keys and information. These units are awesome. The location is perfect, just a short walk to the main beach. We loved Carvoeiro for so many reasons - cliffs, beaches, people, wine and food, just to name a few! We were greeted with a bottle of wine compliments of Gilbert to celebrate our honeymoon. Shops for groceries are also very close, only moments away. Many great restaurants and bars, lots to choose from no matter what you like to eat or your budget. We spent the first two weeks in Albufiera, and then another two in Carvoeiro. There are all kinds of tours to book if a person is interested in that kind of thing. Highly recommend going to Benagil beach and booked a small boat to see the caves. It was incredible, breathtaking actually. The young men who captain the boats are exceptional and make sure the experience is unforgettable. Cost of 17.50 euros each is worth every penny. We will definitely return! And will book either one of these apartments, whatever is available. Obrigada gilbert! Thank you for your very king words. We are that you had a wonderful time and look forward to welcome you in the near future. Appartement très confortable et très bien situé dans la ville; plage, commerces et restaus accessibles à pied. Très appréciés le linge de toilette et de lit changés tous les 5 jours. Petit bémol pour le téléviseur: aucune chaine française, dommage ! Très jolie station très animée en saison , oui , il fait bon y déposer ses valises.